Frankly, if it weren't for the flying eggs, I don't think we'd be covering it. I'm so fed up with these quasi-political video scandals here in Russia. So sick both of this obscene shitstorm - and of the chorus of moralizers that accompanies it. So unsexy, all of it. I stumbled upon some inept Russophone comments on Armenia coming out of Georgia yesterday. Comments that would seem more or less relevant and valid on any other day, but kind of stink on April 24, when Armenians mourn the innocent people killed 95 years ago. It reminded me of the idiots who patiently store their smart opinions about the United States until September 11, as if this is the only day they expect to be heard properly. I don't mean to say that such comments shouldn't be made, but they reflect badly on the people who make them: they are bursting with schadenfreude today, then spend the rest of the year demanding sympathy and support for their own cause and their own innocent ones. And I don't mean to say that the bitchy comments were numerous on April 24 - no, there was just a tiny bunch of them. But they've left me with a really bad aftertaste somehow. 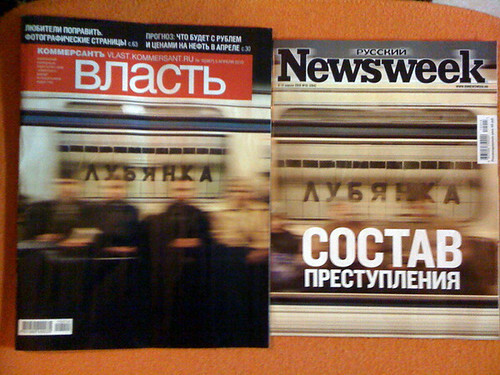 On a different note, I was also reminded of a conversation about Georgia with an ex-Yugoslav friend: he asked for a quick explanation of the summer 2008 situation there - and ended up concluding that Georgia was very much like Serbia. His ex-Yugoslav background is pretty complex, which is typical, and his Georgia/Serbia analogy went beyond the usual good/evil geopolitical labels that stick so well to the two countries. And it has occurred to me now that it's really helpful for a relative outsider to know a thing or two about the situation in the Balkans to better understand the situation in the South Caucasus - and vice versa. I hate generalizations, but I've spent the past nine years convinced that Luhansk is the nuttiest region of Ukraine. I've only been there once, I know, but the experience was so bizarre and nerve-wracking that I just can't help it. It's a long story - a rather comical horror story. Maybe I'll write about some of it one day. Maybe not. 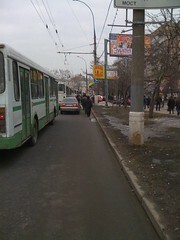 And nothing seems to have changed in Luhansk since late 2000, according to this piece (RUS) on Korrespondent.net. Putin, Lenin and Christ are with us! The only difference, perhaps, is that Natalya Vitrenko is no longer on their minds. 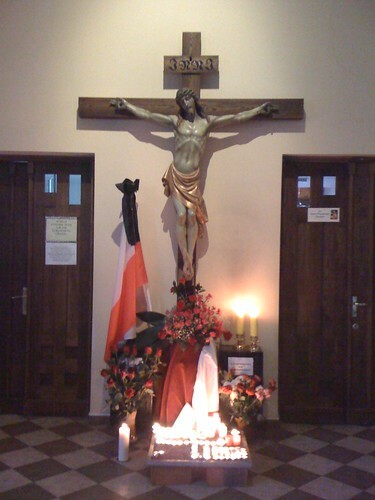 Who knows, maybe ten years ago the chant went like this: "Lenin, Vitrenko, Christ and the Virgin Mary are with us!" First, they'll join forces with the Party of Regions "to kick the nationalists out of the parliament," then they'll "defeat the Party of Regions and kick all the capitalists out of the parliament" - and then, "together with the brotherly nations, they'll build a new union state" - the one that will grant the nations the right to self-determination. Vasyl Tsushko, our new minister of economics and former minister of internal affairs, believes that after nearly 19 years of independence, Ukraine still hasn't come up with clear definitions "of what a poor person is and what a rich person is." He talked about it on Savik Shuster's show last Friday (for a couple minutes, beginning somewhere at 1:54:30). He chose to focus on the problems with public utility payments to convey his vision of the social gap. One of the common arguments, he said, is that the rich ones must pay for their utilities themselves, while the state's duty is to help the poor. But some of the poor are actually quite rich. There's a hypothetical elderly pensioner, male or female, who lives in a three-room apartment on Khreshchatyk, Kyiv's main street, which, according to Tsushko, costs $1 million even in the time of the financial crisis. This person is nevertheless barely surviving on 700 hryvnias a month of his/her state-paid pension (800 hryvnias would be $100, more or less) - and expects the state to cover his/her utility bills. Then there's a hypothetical pensioner who is surviving on the same 700 hryvnias a month in a village 500 kilometers away from Kyiv, in a house with a small plot of land that would sell for no more than $5,000, provided that this village has a road, gas and electricity (some don't, obviously). If we compare these two, Tsushko continued, we'll come to a conclusion that the latter is dirt poor, while the former is a millionaire. Still, the state offers utility payment assistance to both. Some 20 minutes later, at around 2:20 into the show, Vitaly Portnikov, one of my favorite Ukrainian journalists, exposed Tsushko's messy reasoning as a Freudian slip totally typical of a Ukrainian government official. Yes, right, he said, let's kick those elderly people out of their expensive Khreshchatyk and Lipki apartments - and move in there ourselves. Tsushko tried to argue that Portnikov had misunderstood him, but with little success: his point was, he said, that a person with $1 million in assets shouldn't be walking around begging for money. I can only add that there remains just a handful of those elderly people on Khreshchatyk who, according to Tsushko, aren't aware of the fortunes they are sitting on/living in. There are not enough of them to deal a serious blow to the state budget: they aren't the real culprits. Many of them tend to vote for Tsushko's friends in the Party of Regions, too - but, apparently, "their number is negligible and they are stupid" (apologies to Dwight Eisenhower for using this quote in a somewhat wrong context). 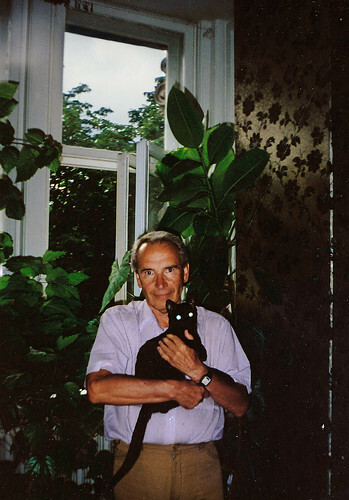 What a wonderful photo of my father - and of my 18-year-old blind cat, Kosya, who died on April 15. I'll never stop missing them. Somehow ran into this Jan. 2006 interview (RUS) with Myroslava Gongadze on Radio Ekho Moskvy. 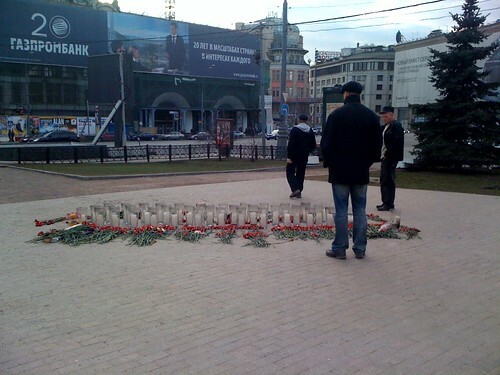 Don't have the energy to post any background or other info/thoughts - mainly because it is common knowledge that, nearly ten years later, those who ordered to kill Georgi Gongadze still haven't been brought to justice. And this, more or less, is the only thing that really matters. But - I can't resist translating Myroslava's description of the room in which the trial of Georgiy's suspected killers was initially held. Again, I don't know where or how to begin this post. 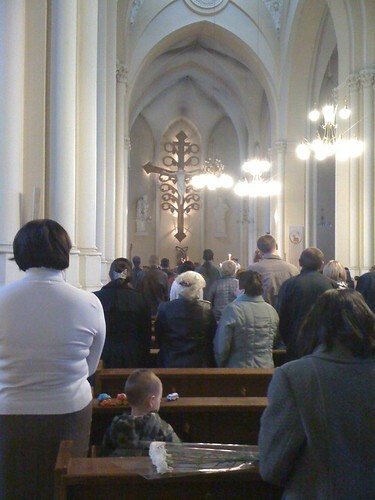 I stayed through most of the Russian-language service at the Cathedral, even though I normally prefer to listen to religious messages in languages that I don't understand. 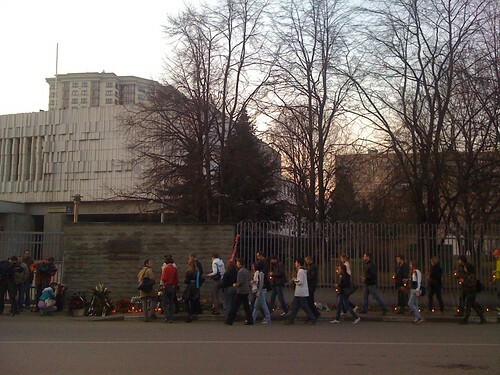 I was on my way home from the Cathedral, passing by the Embassy once again, finally feeling as peaceful as was humanly possible under those circumstances, and I wouldn't have paid attention to a group of ordinary-looking young people - relatively well-dressed, cheerful, carefree - at the trolleybus stop across the park from the Embassy, if it hadn't been for the flowers and candles in their hands. An even number of flowers - two or four: a funereal arrangement. Mostly red carnations. I stopped nearby, sort of automatically, and almost right away they regrouped into a neat column and marched off towards the Embassy. 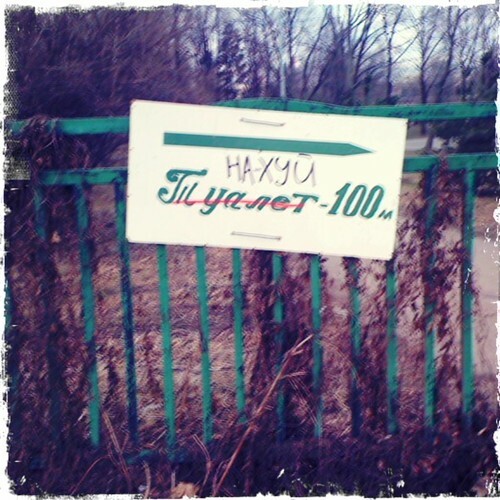 One or two of them were wearing green hoodies, on which I later spotted the word МЕСТНЫЕ (Mestniye, 'The Local Ones') - a youth group that I couldn't recall anything specific about right then, only some vague memories inspired by the group's somewhat xenophobic name. 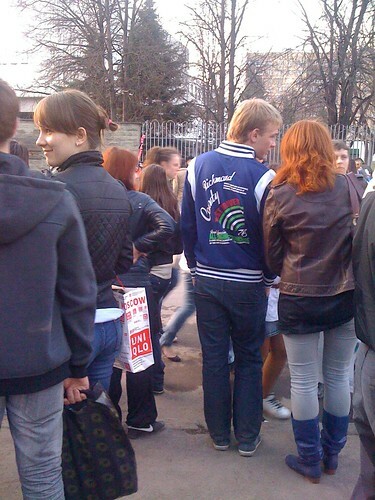 'Kremlin youth,' I thought, using a very convenient shortcut to label this sort of crowd. 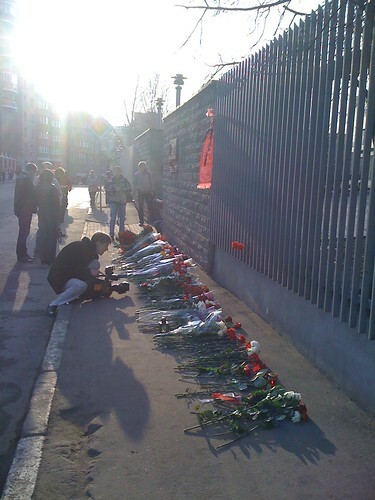 Those of the kids who were done with the commemoration part were crossing the narrow street, and now I was standing right behind some of them, close enough to hear them giggling, chatting, discussing who was going to be on the evening news. It was disgusting. And then they all left, dispersed, as quickly as they came. 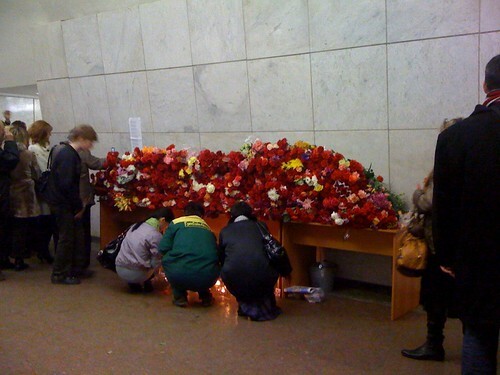 Back home, I watched a newscast on Channel 1 - and, sure thing, the kids were on it, as sympathetic Muscovites. Not a word about the group that these kids belong to - even though there's an item (RUS) on Mestniye's website about their April 10 initiative. 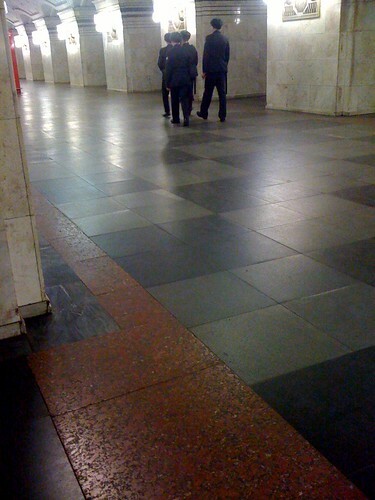 Ordinary Muscovites. The journalistic aspect of it seems very interesting. 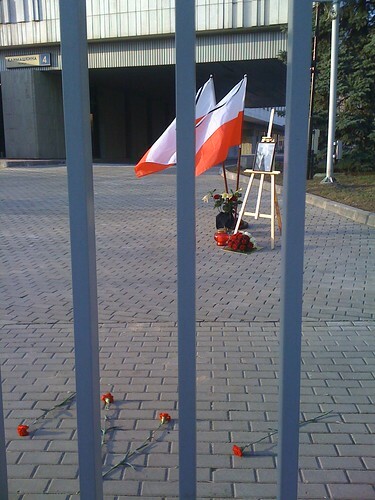 There weren't too many people by the Embassy on Saturday. Just enough from a human point of view - but not enough for a good TV picture that would adequately reflect the current Poland-friendly agenda. So they bring in these kids, to act as extras. News as movies. A tiny little example of yet another manipulation, nothing new, not a big deal - but since I don't have any firsthand TV experience, it was pretty educational to witness how those guys work here. Something that I can't stop thinking about: the fact that the language of communication between the Polish crew and the Russian air traffic controllers was Russian. And some broken English. To what extent could this have contributed to the tragic outcome? Mentions of this "language issue" here and there, now and then, and still some more (all in Russian); in English, a Wikipedia summary - here. Things are moving too fast, and I can't keep up. One déjà vu followed by another, flashback after flashback. Having a nasty cold doesn't help. Below are some links and stuff - the post is messy and way too long, but I need to sort things out for myself a bit, to be able to move on. I feel very sad for the people who were hurt and killed in the riots. And the social media component - endless discussions on whether this or that unrest was "a Twitter revolution" or not, etc. My last year's GV roundups on Moldova are here, here, here and here. 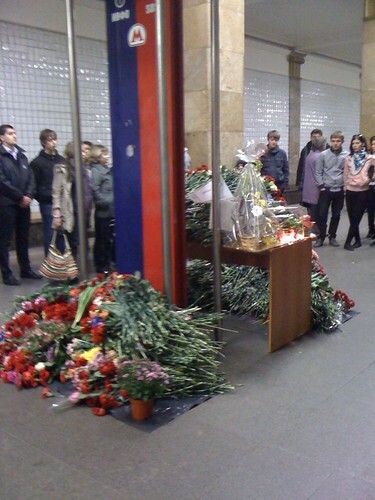 Alexey Sidorenko's GV text on Kyrgyzstan is here (and on the Moscow subway bombings - here). I took subway last Saturday. On autopilot, sort of. Not out of necessity. Without flowers, though. Entered at Park Kultury, meant to go to Lubyanka from there, but was so overwhelmed by what I saw that I took a train in the opposite direction and only noticed this when the next station, Frunzenskaya, was announced. 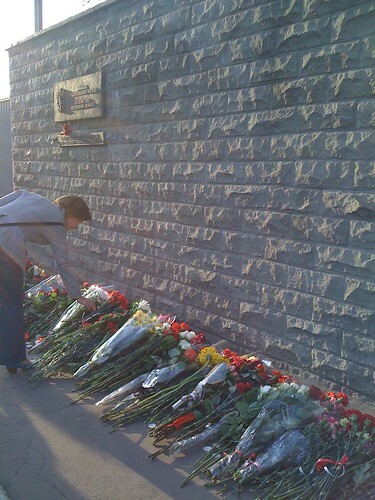 When I entered the train car at Park Kultury, every single person in it was trying to have a look at the makeshift flower memorial on the platform. Halfway to Frunzenskaya, a sharp, explosive sound made nearly everyone in the car jump - turned out it was a balloon that burst in the hands of a little boy traveling on that train with his mother. A group of teens sitting across the aisle from the boy began to laugh, and many passengers, including myself, managed to produce nervous yet relieved smiles after that, too. 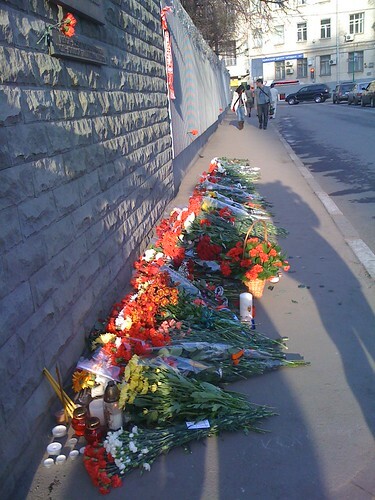 I got off at Sportivnaya, took a picture of four skinny, young cops guarding the empty station, then got onto a Lubyanka-bound train and happened to stand next to a young woman with four red carnations, who got off at Park Kultury and walked towards the crowd gathered around the memorial. 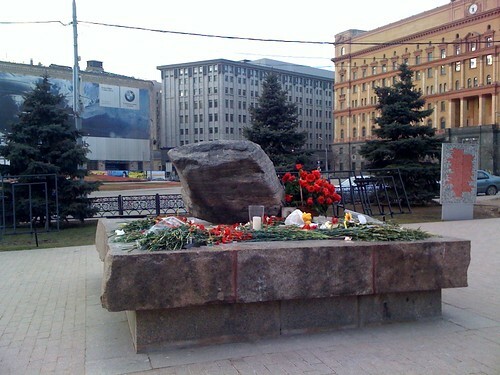 At Lubyanka, there were flowers both on the platform and outside, next to the Solovetsky Stone. [...] on the edge of the compound there's a makeshift bus station, with a few dozen buses, most of which are ready to depart for Makhachkala, Dagestan. And Derbent, and Budyonnovsk. Lots of people with huge bags and sacks nearby. Quite impressive - and, needless to say, it didn't even occur to me to attempt to take a picture there. I felt happy, though, that there was no way for Moscow skinheads to attack these people - if the fence isn't enough, Luzhniki seems to have enough human security guards, too. Another "back to reality" thing I remembered from that evening was the crazy old woman at a grocery store across the street from us, where I went to buy cigarettes: she was loudly cursing the store's non-Russian staff - for some reason, or for no reason at all. "Go back to your Dagestan," she was screaming. And - "I'm a native Muscovite!" And then one young Russian man standing in line in front of me told her indignantly that she was such a disgrace, and she shut up and left. P.S. While I was writing my previous post, they seem to have updated the New York Times piece, and the stuff in the quote that I give has been somewhat re-arranged, but is still there. There's a ton of articles about this girl in other media. 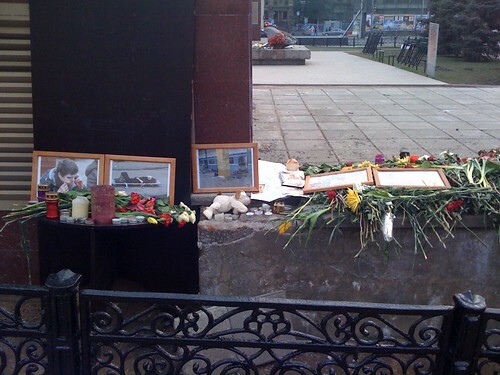 Some confusion about whether this girl blew herself up at Lubyanka or Park Kultury. 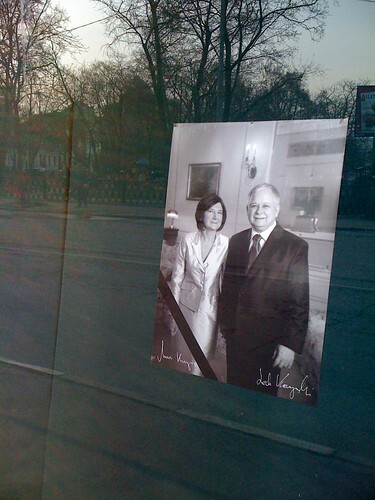 He got off at Park Kultury, and was a few feet away from the woman when the bomb detonated. Sparks appeared before his eyes and the station went silent. When he came to his senses, he saw bodies in piles on the floor of the train. One of them was Ms. Abdullayeva’s. An article in the New York Times about one of the suspected suicide bombers, a 17-year-old from Dagestan. A picture of her with a gun - and with a guy with a much bigger gun. A cab driver from Dagestan, two weeks ago, on Nowruz, was telling me about the beautiful hospitality his people exhibit during the holiday celebrations - you can enter anyone's house, he said, and you'll be offered all the food and drink there is in the house - and there's a lot! - and you'll be treated like a king, even if you're a stranger. 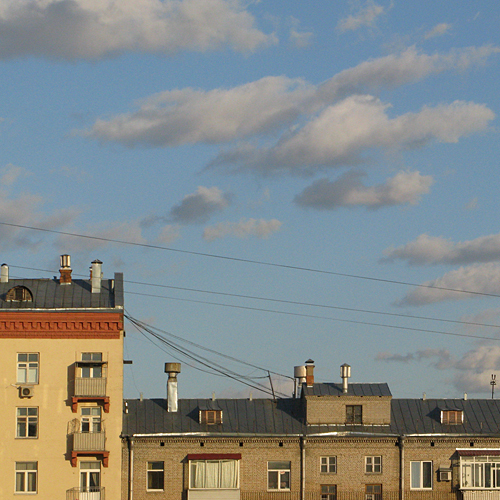 And Moscow, it's such a tough city, he added. I said it was a pity that there was so much fighting and hatred in the Caucasus region, a pity it wasn't safe to travel there, and he replied that there wasn't any fighting whatsoever. Right, I thought. "Muslim people are very good, aren't they?" he asked, after I told him about our trips to Istanbul, the regular escapes for warmth and friendliness. I hate generalizations, but he was so cheerful and so homesick that it seemed wrong to go into my usual mantra: "There are good people everywhere - but, unfortunately, there are as many assholes everywhere as well, if not more." So I just said that I had many Muslim friends - and that I loved them all. And five minutes later, by the end of our ride, all of a sudden, he was fuming about how amoral people in Moscow were - how you always saw young women smoking and drinking beer in the street here - a totally unacceptable behavior, blah blah blah. I laughed it off, sort of, saying that I, too, couldn't understand how they could drink that beer outside in such cold. I've been thinking about this cab driver on and off this whole past week. Somewhere along these lines: "И эти люди не разрешают нам ковыряться в носу?" And these people aren't allowing us to pick our noses? [...] A local official in her native village of Kostek said Ms. Abdullayeva attended school there for six years, then moved to a larger city a few years ago. The official, Aida Aliyeva, said in a telephone interview that Ms. Abdullayeva was raised by a single mother who traded goods at a local market. Teachers in the village remembered Ms. Abdullayeva as a promising student who recited poetry in local competitions, she said. An official at Dagestan’s Interior Ministry said it was not uncommon for militants’ wives to act as accomplices, and some were members of hierarchical women’s organizations linked to the insurgency. The official, who spoke on condition of anonymity, also said that it was not difficult for militant groups to recruit teenage girls in a region with more women than men. I still haven't watched a single TV newscast - cartoons is all we watch here. 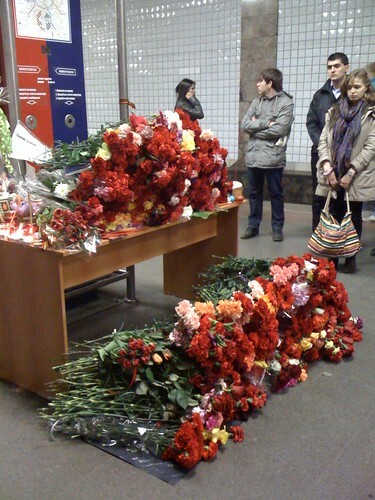 And I still haven't been to Park Kultury or Lubyanka stations - I might go there over the weekend, with flowers. I've seen photos from the scene on the web, of course, but the only thing directly related to the tragedy that I saw firsthand were the white-and-green buses riding back and forth down our street on Monday morning - dozens of them, thrown in by the city to substitute for the disrupted subway service on this route. A shocking image to wake up to, partly because it reminded me of the 2002 Nord-Ost theater siege, when the same buses were lined up along Dubrovka Street, awaiting the release of the hostages. These buses, now and then - they are like visual bookmarks in my mind. And the story - it keeps getting recycled. Once again, I've re-read what I wrote about Nord-Ost back then: most of it, though not all, reads smoothly, as if it all happened earlier this week - and it did, in a way - and it still hurts like hell, especially now. Beslan and the murder of Politkovskaya weren't part of the narrative in 2002 - these events belong to the recycled versions of the story.